This is Cruz, he was born in June 2011. He is 19 months old and has Total Colonic Hirschsprung’s Disease. Little Cruz had been in and out of the hospital since almost birth and the medical bills are piling up. Friends of Cruz's Mom and Dad are having a golf tournament to benefit the trust of Cruz Davis on March 13, 2013 at the Tribute Golf Club in The Colony. Click on the picture to learn more about Cruz and his disease and to register for the tournament. If you are not a golfer, or you are not local, but still want to help, you can make a donation to the trust of Cruz Davis by clicking on the register tab. 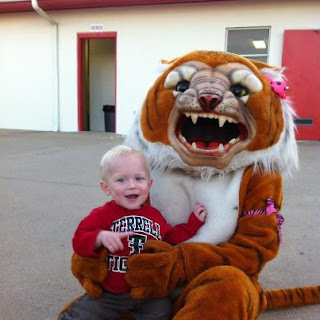 Cruz's Daddy is Gage Davis, Head Coach of the Varsity Tigers baseball team and Head Coach of the Tigers Freshmen football team. I didn't take the photo, it was provided to me.